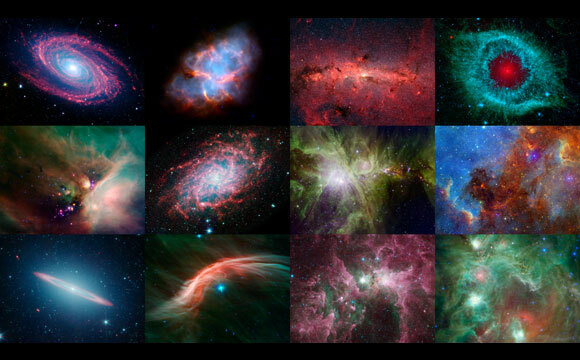 NASA has released a new digital calendar to celebrate the 12th anniversary of the Spitzer Space Telescope. The calendar showcases some of the mission’s most notable discoveries and popular cosmic images. The calendar follows the life of the mission, with each month highlighting top infrared images and discoveries from successive years — everything from a dying star resembling the eye of a monster to a star-studded, swirling galaxy. The final month includes a brand new image of the glittery star-making factory known as the Monkey Head nebula. Spitzer, which launched into space on August 25, 2003, from Cape Canaveral, Florida, is still going strong. It continues to use its ultra-sensitive infrared vision to probe asteroids, comets, exoplanets (planets outside our solar system) and some of the farthest known galaxies. Recently, Spitzer helped discover the closest known rocky exoplanet to us, named HD219134b, at 21 light-years away. In fact, Spitzer’s exoplanet studies continue to surprise the astronomy community. The telescope wasn’t originally designed to study exoplanets, but as luck — and some creative engineering — would have it, Spitzer has turned out to be a critical tool in the field, probing the climates and compositions of these exotic worlds. This pioneering work began in 2005, when Spitzer became the first telescope to detect light from an exoplanet. — Buckyballs in space. Buckyballs are soccer-ball-shaped carbon molecules that have important technological applications on Earth. — One of the most remote planets known, lying about 13,000 light-years away, deep within our galaxy. Spitzer continues to help in the search for exoplanets using a state-of-the-art method called microlensing. — “Big baby” galaxies. Spitzer and Hubble has found remote galaxies that were much more massive and mature than expected. Be the first to comment on "New Digital Calendar Celebrates 12th Anniversary of the Spitzer Space Telescope"